Quick. Name the father of Fiesta ware. Yeah, ok. Neither could I. Well, his name is Frederick Rhead and one of his rare, earlier (non-Fiesta) vases just broke the world record for American art pottery at the Rago Arts and Auction Center on March 10. The price for this 11-inch piece of clay? $516,000. Nope. Not a misprint. A half-million greenbacks. 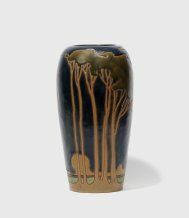 The previous art pottery record ($305,000, set in 2004) was held by a piece of 1900 Rookwood, the art nouveau-styled Black Iris vase. Last October, a tall, luminous piece by German emigres Otto and Gertrude Natzler hit $252,000. But Frederick Rhead is something of a dark horse for the top spot (which goes to show that you should always buy a piece, not a name). Before he designed the ubiquitous deco dinnerware known as Fiesta, he was an accomplished arts and crafts guy-a Brit-born potter who, after coming to the States, gradually lost his fussy English approach to decoration. Long about 1915, after stints designing at Weller, Roseville and virtually every other American pottery hot spot (David Rago called him the "Forrest Gump of art pottery," being everywhere that art pottery was happening), he ended up running his own shop in Santa Barbara, Calif. It was in many ways the zenith of his career. So why did this one snag the top price for an American art pot? It had been last bought in 1993 for $30,000 (very big bucks at the time) and had been estimated at $40,000-$50,000, reportedly due to some hairline cracks. Still, it sang. While most of Rhead's designs were produced by anonymous line artists, this vase was one of the very few pieces made by his hand from this era. In fact, only two in this style are known, and the other one is in the Metropolitan Museum. It shows Rhead in full stride, mustering all of his ability to finesse the arts and craft style. In this case, it's truly plein air painting on clay, expressed with his exquisitely understated subtlety. And it's a technically challenging piece to boot-an enameled vase with sgraffito outlining. Many of the pieces from these years were experimental in nature and suffered from overfiring. This one, happily, did not. It was purchased by Rudy Ciccarello of the Two Red Roses Foundation in Tarpon Springs, Florida. He says that it will be on view with the rest of his art pottery collection next summer (2008) at the St. Petersburg Art Museum.